Videos, examples, and solutions to help Kindergarten and Grade 1 kids learn to add and subtract within 20, demonstrating fluency for addition and subtraction within 10 by using strategies such as making ten (e.g., 8 + 6 = 8 + 2 + 4 = 10 + 4 = 14). I can add and subtract within 10 easily. 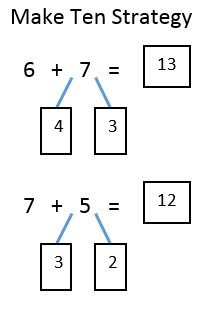 The following diagrams show how to add using the Make-Ten strategy. Step 1: The first addend and what make ten? Step 3: The number below the second addend and what make the second addend? This video explains how to use mental strategies to add within 20 using the "make 10" strategy. This is one of the strategies suggested in the Common Core State Standards for Mathematics, 1.OA.6 and 2.OA.2. With practice, this strategy can help students gain fluency when adding within 20. Eventually students will memorize these facts, which is expected by the end of grade 2.